The supporter movement is expanding. 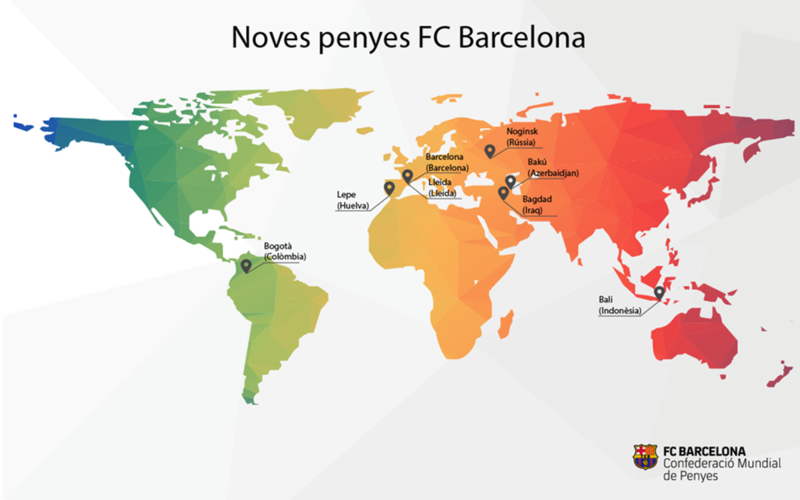 Yesterday, the FC Barcelona board of directors approved the inclusion of eight new penyes, five of which are international, from three different continents (Asia, America and Europe), whereby the Supporters Clubs World Confederation now has a total of 1,283 supporters clubs around the world: 456 in Catalonia, 700 elsewhere in Spain and 127 in the rest of the world. The two Catalan clubs are the Penya Barcelonista de Lleida 1970 (the second in the capital of the Segrià region) and the Penya Blaugrana Àrab de Barcelona. The new Spanish club is the Penya Barcelonista El Triplete de Lepe (Huelva), which was actually founded in 2015 but has only just applied for official recognition. But the internationalisation of the supporter movement has been made apparent by the inauguration of the Penya Blaugrana de Bali (Indonesia), the Penya Barcelonista de Bakú (Azerbaijan), the Penya Blaugrana Ossos Russos (Russia), the Penya Blaugrana de Bagdad (Iraq) and the Penya Corazón Blaugrana de Bogotá (Colombia). The latter forms part of the expansion of the club’s membership and support base in Colombia and is being forwarded as an indispensable partner for the FCB Escola soccer schools being set up in the Colombian capital. -Penya Blaugrana de Bali (Bali, Indonesia). -Peña Barcelonista de Lepe Segundo Triplete (Lepe, Huelva). -Penya Barcelonista Lleida 1970 (Lleida). -Penya Blaugrana Àrab de Barcelona (Barcelona). -Penya Barcelonista Bakú (Baku, Azerbaijan). -Penya Blaugrana Ossos Russos de Noginsk (Noginsk, Russia). -Penya Blaugrana de Bagdad (Bagdad, Iraq).